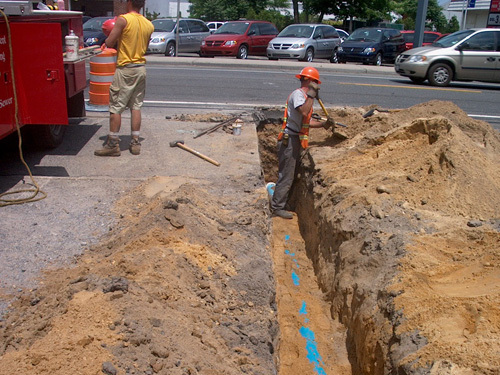 It is very important to every household to have a proper and responsible water line connection. Normally water meter and service installation are property and responsibility of the water department. Installation will only occur once the property owner signed an agreement with the water department and ready to hook up for the water service. Sinclair Plumbing makes it easy and seamless for you, provided our high quality pipes and professorial installation and repair. Newly constructed houses will require the drains be connected from the house to the city sewer system.Just attaching the house to the sewer is not an easy task. We need to consider the slope of the drain pipe, as it is crucial in sewer hookups. Slope that are too little may cause the water not to move or to back up. Slope that are to steep may cause the water to run too fast, leaving the solid waste behind. On the other hand, upgrade or repair is needed for existing homes. Pipes lying under the basement floors build up mineral deposits over time, which may require replacement. Clay pipes that are commonly used by older homes could become collapsed and clogged by tree roots, also needs to be replaced. Our Sinclair Plumbing professionals have the experience working with sewer services for newly constructed homes and older homes to make a flawless connection. Call us now.